That was a typical response I got to last month’s column, “Federal Spending for Dummies.” It struck me as a legitimate reaction. After all, President Bush and a Republican-controlled Congress cut income tax rates for all workers in 2001. Specifically, they reduced the top marginal income tax rate from 39.6 percent to 35 percent. Additional tax-reduction legislation was passed in the ensuing years which lowered various tax rates for America’s most productive workers. The suggestion was that government revenues shrunk because of these tax cuts, depriving the treasury of funds and driving up the deficit to unprecedented levels. I decided to check it out using my Federal Spending for Dummies model. For the 1980’s (1980 through 1989), the federal government collected an average of $22,688 per citizen for that decade. For the 1990’s, they collected an average of $26,179 per citizen. For the 2000’s, they collected an average of $29,427 per citizen (2009 tax receipts are estimated). Remember, these numbers adjust for inflation and population. According to my calculations, the treasury was not drained by the Bush tax cuts. In fact, they collected more than ever from all sources, even income taxes. In the 90’s, the government collected $11,889 in income taxes per citizen compared to $13,357 in the 2000’s. Were the Bush tax cuts at the expense of us working class Americans? In other words, did the rich bear a lighter load? Here is where the confusion sets in: there has been a steady reduction in average tax rates for high earners since 1980. Back in 1980, the average tax rate (as a percentage of adjusted gross income) for the top one percent of earners was just under 35 percent. By 2007, the percentage had dropped to just over 22 percent. That’s a pretty good deal for the fat cats, isn’t it? Not so fast. Their total share of the nation’s income tax load increased from about 19 percent in 1980 to about 40 percent in 2007 according to the IRS. In one generation, the tax load shouldered by the rich doubled. The rich paid more when we cut their taxes. The top 25 percent of earners pay nearly 87 percent of the nation’s income tax; the bottom half pay less than 3 percent. When you penalize (tax) productivity, you get less of it. Lower marginal tax rates reward productivity. So if the problem isn’t the tax cuts for America’s most productive workers, it must be big corporations. They must not be paying their fair share. Not according to the President’s Office of Management and Budget. Their tax charts reveal that corporations picked up a bigger share of the income tax load under Bush than Clinton (12.1 percent in Bush’s last year in office compared with 10.2 percent in Clinton’s). 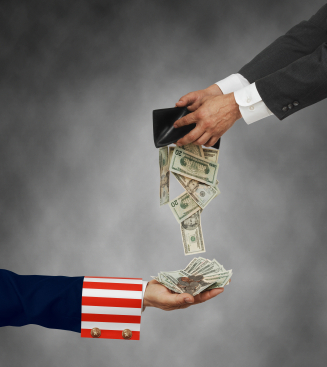 The evidence suggests that tax cuts weren’t the root cause of America’s growing indebtedness. Spending is the problem. For the past thirty years, the federal government’s tax haul has averaged 18.4 percent of our Gross Domestic Product (GDP). Entitlement spending will soon swamp that number. In 1980, entitlement spending (Social Security, Medicare, and Medicaid) consumed 7 percent of GDP. The number is growing, projected to reach 10 percent of GDP by 2015. The Congressional Budget Office tells us it will consume 18.5 percent of GDP by 2055. In other words, our entire budget, if we go by the historical tax share of GDP, will be consumed by just these three budget items in the next generation. Taxes will have to be raised to unprecedented levels. Lifestyles will be a shadow of what America knew. Is this the responsible thing to do to our kids? We have a spending problem in America, not a tax problem.